It is essential to reassure port authorities that should a vessel run aground, collide with another ship, or become involved in an oil spill or other serious incident, that insurance cover is in place to pay for damage to ships, ports or the environment. The enormous costs associated with the Deep Horizon spill in the Gulf of Mexico of between $2 billion and $5 billion, or the still evolving Fukushima disaster in Japan, have driven home the potential cost of nightmarish accidents. The Exxon Valdez showed litigation and reparations could take decades to resolve. IRISL’s P&I cover was withdrawn by Lloyds of London in 2009 following UK sanctions against the shipping line. IRISL then found cover from a P&I provider operating out of Bermuda. In 2010, Bermuda passed legislation, bringing the country in line with the UK. ‘EU regulations have resulted in cover being terminated or not renewed for a number of designated Iranian shipping companies including IRISL and the NITC (National Iranian Tanker Company),’ Bardot says. IRISL then approached the Islamic P&I club, which refused to provide cover. Finally, IRISL secured P&I cover from Moallem, an Iranian insurer with no record of providing this type of insurance. NITC was faced with a similar issue with regards to P&I cover and has publicly stated it is using an ‘Asian P&I provider’ with cover that’s reliable, but more expensive than that secured through London. However, the lack of transparency on the identity of the provider does nothing to reassure on the reliability of the cover. Either way, on December 21, the US Treasury sanctioned Moallem. All P&I providers re-insure against catastrophic losses, which kicks in for large exposures, but it isn’t clear who Moallem uses for re-insurance. Major European insurance houses wouldn’t be in a legal position to offer cover, leaving the Peoples Insurance Company of China (PICC) being touted as a possibility. But analysts say that given its ongoing negotiations over access to Lloyds of London, it was highly unlikely that PICC would risk its international standing by being associated with a controversial and sanctioned client like IRISL. Within maritime circles, the presumption is the Iranian government is the reinsurer of Moallem. 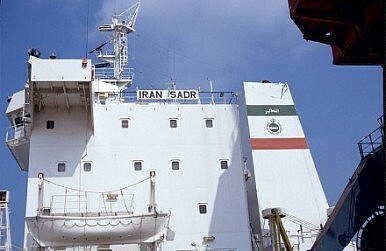 But analysts say that given the doubts over Moallem and the severe restrictions on the Iranian government, banks and other institutions, the key question is how IRISL and Tehran would react to a shipping and environmental calamity, and what options would be open for redress and compensation. It’s an issue that Greenpeace says must be addressed by the 10-nation Association of South East Asian Nations (ASEAN) given the threats to livelihoods and food security – and it says that any legal loopholes should be closed, while uninsured ships should be barred from entering regional ports. Keith Loveard, a regional security analyst with Jakarta-based Concord Consulting, says an Iranian shipping disaster off the coast of Indonesia would likely cause a rift within government, as was seen with the leak from a Thai rig off the northern Australian coast last year. Others suggest one means of recovering costs incurred in dealing with an environmental incident would be to sequester any Iranian state-owned property or assets within the affected country, such as aircraft operated by state-owned Iran Air. Gavin Greenwood, a risk analyst with Hong Kong-based Allan & Associates, says the recent seizure of a Thai aircraft used by the country’s crown prince in Germany to try and resolve a long standing dispute over money was one example over how this could work. Mohan Malik, Professor of Asian Security at the Asian-Pacific Center for Security Studies in Honolulu, says the location of an accident involving the Iranian shipping line would also be important. ‘If it happens in the busy Malacca Straits or in the South China Sea, most littoral and major powers will be forced to contribute to the clean-up in order to facilitate an uninterrupted flow of energy and goods,’ he says. The IMO declined to comment on IRISL. However, sources close to the organisation say it has been undertaking amendments to its strategic direction in regards to liability and compensation claims in the wake of the Deep Horizon disaster. Most maritime authorities demand a Blue Card from the P&I insurer as evidence that sufficient insurance is in place to meet liability requirements under the Bunker convention. But in Asia it’s not clear how routinely this is enforced or checked. If a maritime agency had doubts about the owners or operators ability to meet a liability it is able to deny a vessel entry or exit from ports or waters under its control. Thayer says that lack of clarity in Asia demonstrates ‘yet again’ the weakness of the region’s security architecture and the reluctance of many Asian states to support sanctions. While the United States, EU and UK have taken the lead against Iran in regards to its declared and undeclared nuclear weapons ambitions, the real world impact of those sanctions are now being seen well beyond the Iranian interests that have been targeted. IRISL continues to operate in Asian waters, with untested and unproven insurance. The responsibility for ensuring Asia doesn’t become a victim of events in Iran now rests squarely on the shoulders of Asian governments and their maritime authorities.